New figures from the U.S. Treasury Department indicate that the government has a total operating cash balance of $73.768 billion, less than Apple's own war chest of $75.876 billion. As noted by Matt Hartley of the Financial Post, the news comes even as Republican and Democrat lawmakers debate over the federal budget and debt ceiling. The government's $73 billion number actually represents the "financial headroom" that lawmakers have before reaching an arbitrary debt ceiling, according to the report. 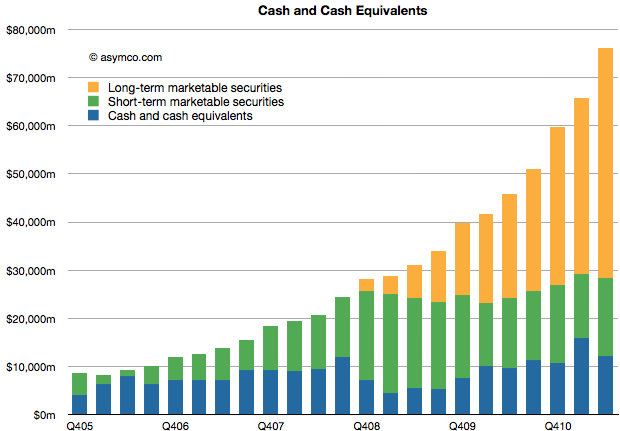 Apple reported having nearly $76 billion in cash on hand as of June 25, 2011. That's an impressive increase of $10 billion from the previous quarter, when the Cupertino, Calif., company had $65.8 billion in cash reserves. Apple's war chest has grown quickly since 2005, when it had just $9 billion in reserves. As of the end of 2010, Apple's $60 billion stockpile gave it more cash than any other non-financial company in the U.S.
Shares of Apple closed above $400 for the first time earlier this week, before settling down some, eventually closing at $391.82 on Thursday. The company's market capitalization stands at $363.25 billion, behind only Exxon Mobil, which boasts a market cap of $403.93 billion. As Apple's cash reserves have soared, several analysts and investors have called for a dividend that would redistribute some of the company's profits to shareholders. However, Apple CEO Steve Jobs has said that the company's cash hoard is being saved for big moves. "We don't let the cash burn a hole in the pocket or make stupid acquisitions," he said last year. "We'd like to continue to keep our powder dry because we think there are one or more strategic opportunities in the future." Patent acquisition may be one such strategic opportunity for Apple. The company recently paid $2.6 billion to outbid rival Google, which had $39.1 billion in cash reserves at the end of June, for a collection of more than 6,000 patents from Canadian telecom equipment maker Nortel. Apple teamed up with a consortium that included Microsoft, Research in Motion and Sony, pooling the group's resources in order to place the $4.5 billion winning bid. Apple is also said to be weighing a bid for Interdigital, a company with a portfolio of 8,800 patents. InterDigital CEO William Merritt claims his company's patents are "deeper and stronger" than Nortel's collection.